In January 2018, Gibon was launched as a new company and as a new brand. 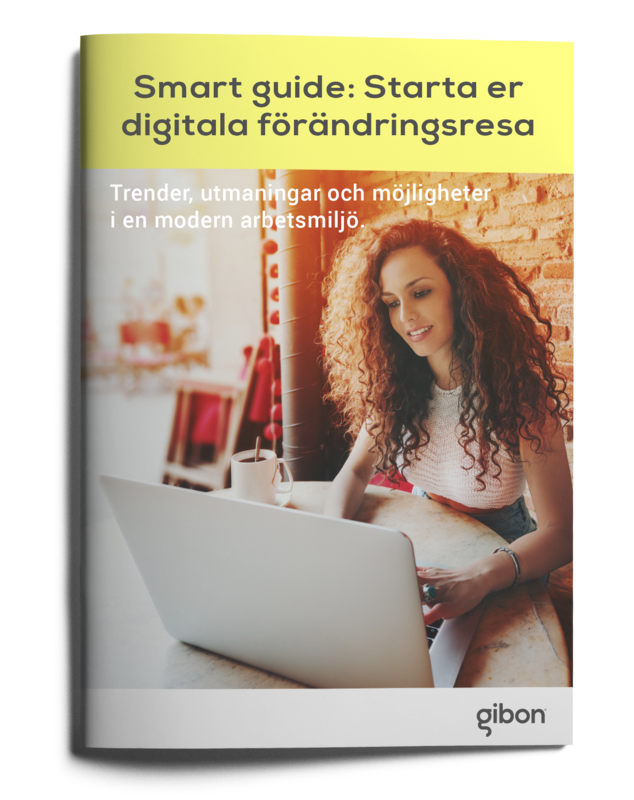 Gibon offers IT solutions to small and medium sized business in Sweden and have 10 offices. Their challenge was to establish their newly launched brand on the Swedish market and generate business opportunities and leads. 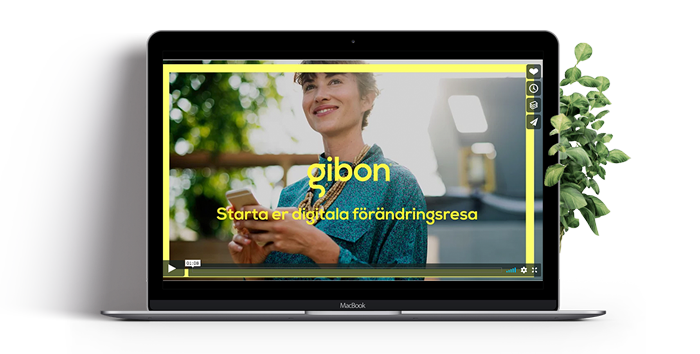 Brightvision was hired to create an integrated marketing campaign with the purpose of creating awareness around Gibon’s new brand as well as generating qualified leads (MQLs) with a proven ROI of the campaign. The goal was to generate leads and build awareness around the new brand . In order to to succeed and reach this goal, we made the decision to use an inbound driven campaign focusing on providing the right content, to the right target group, in the right time, with telemarketing as an integrated part. The work we did can be divided in eight categories (see below). We started the campaign with identifying the target group by creating 3 different persona for the campaign. This was done by market research as well as interviews with sales people at Gibon. 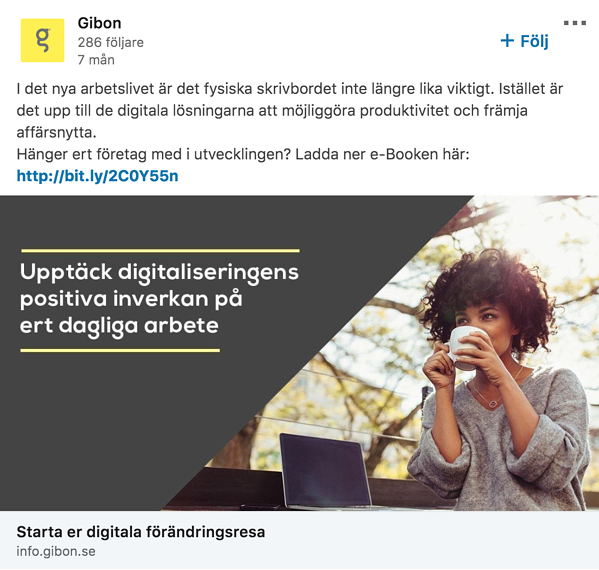 We used existing pre-made content to drive leads, and we re-branded the content aligned with Gibon’s graphical profile (also called "white label content"). This way we could quickly produce and launch different content assets. 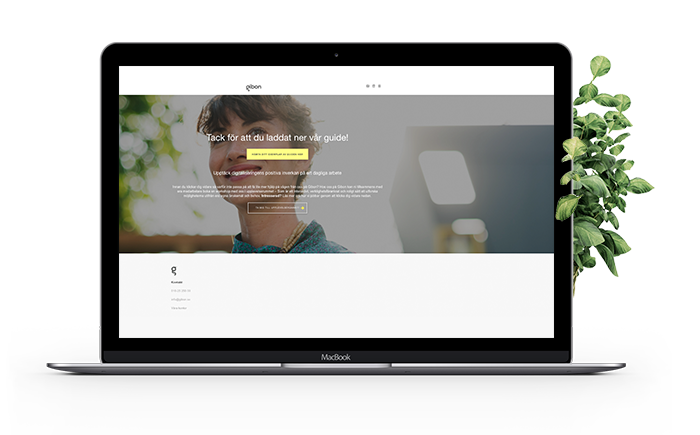 The main content promoted was a whitepaper called “Start your journey towards digital change” and was created to help companies to take the first steps into the new and modern workplace. 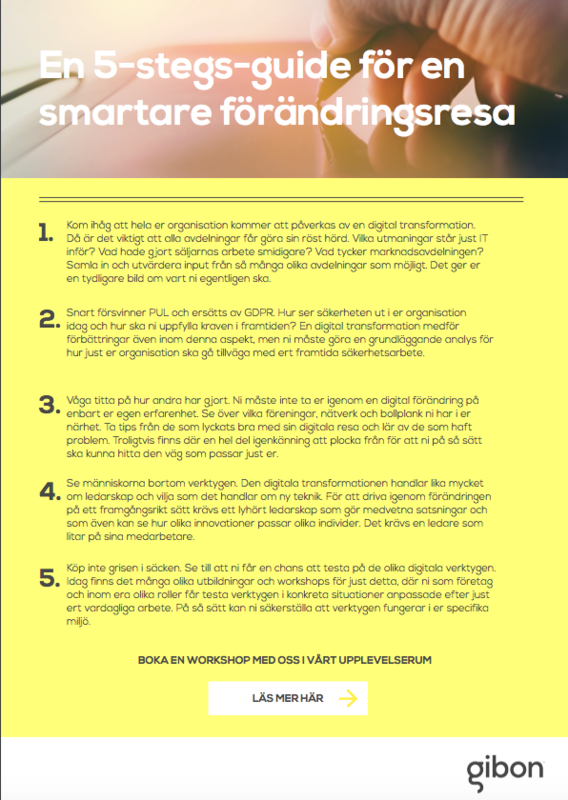 We also created a one-pager checklist used as follow-up content and nurturing purpose. 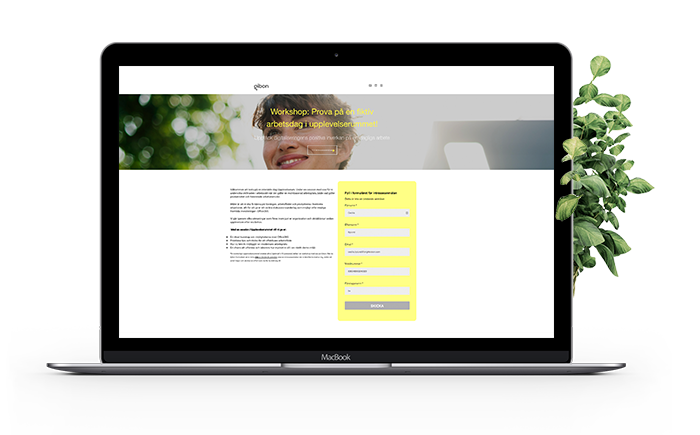 5-step checklist: "For a smarter journey towards digital change"
The landing page is a pivotal component of the campaign, driving leads to convert by using forms. 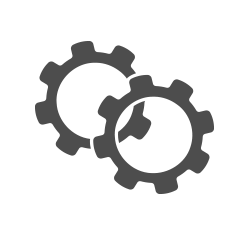 By using SharpSpring Marketing Automation system, we were able to gather all information like website visits, conversation rate, list etc in one place. We created social posts to drive leads to each landing page/premium content, customizing each social content after the partners audience target and persona. We used both paid social (sponsored) and organic posts in channels like LinkedIn and Facebook. To ensure maximum relevance for the partners’ target audiences, each email was personalized. Within the MA-system we used email nurturing to convert leads from unqualified leads to MQLs using an email nurture workflow cadence consisting of three emails containing consideration stage content and new call to actions. We created a ”KIT-film” for the campaign as a complementary to the banners on social media, as videos works great to generate traffic to landing pages. 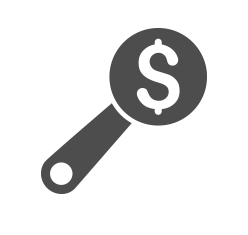 The blog article was an important part to drive the organic traffic and leads to the landing pages offers. With a clear call-to-action in the post, we were able to point the visitors to the downloadable content and generate leads. To qualify the leads coming in from the inbound campaign, we used our telemarketing team and Inside Sales specialists. After someone becomes a lead, our SDRs called and qualified the lead. Depending on the outcome, we routed the qualified leads to Gibon's sales department. If the lead was not qualified, we kept it in our process for further nurturing. 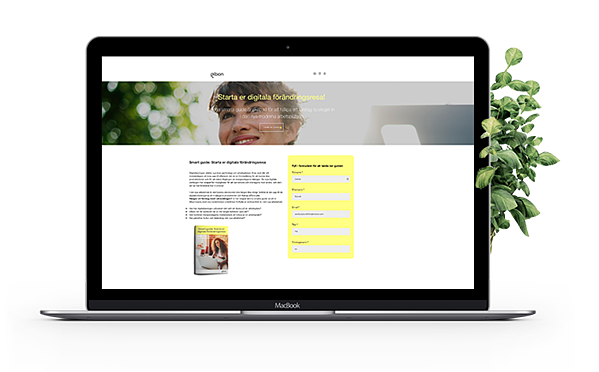 For this project we used SharpSpring as the marketing automation and CRM software (of which Brightvision is a certified partner agency). 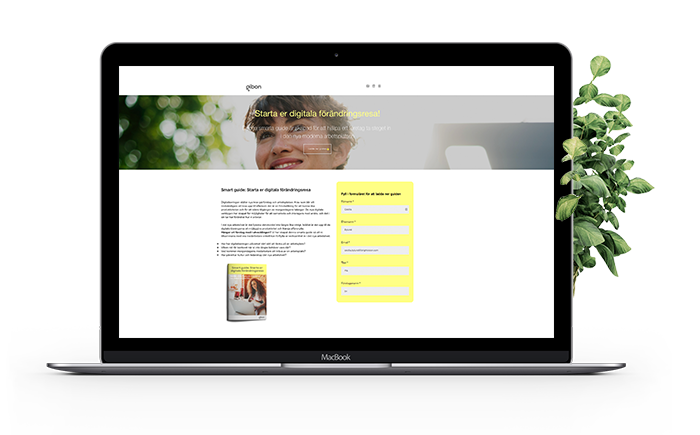 As the SharpSpring tool supports the inbound methodology, it simplified all work processes and enabled us to work with all marketing channels (like social media, email marketing, web, landing pages, forms, nurturing/workflows etc) in an integrated way. It was easy for us to optimize and create reports as we controlled and measured all work from one system. Since SharpSpring is paid on a monthly basis, it was also ideal for this shorter campaign. 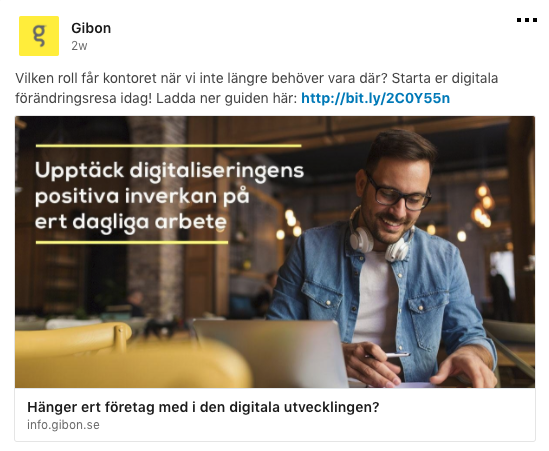 During the pilot period, Gibon had an initial paid media budget of 30,000 SEK. Using LinkedIn's sponsored ads, the campaign generated a total of 68 MQLs. Out of these, 26 became SQLs, resulting in a generous 38% conversion rate. We launched five sponsored ad campaigns consisting of 12 ads. Below, you see the highest performing ad, generating a CTR of 1.14%. This is three times as high as LinkedIn’s average CTR of 0.3-0.45%. The eBook landing page was the primary destination during the campaign. See the results below. So what's next for Gibon? 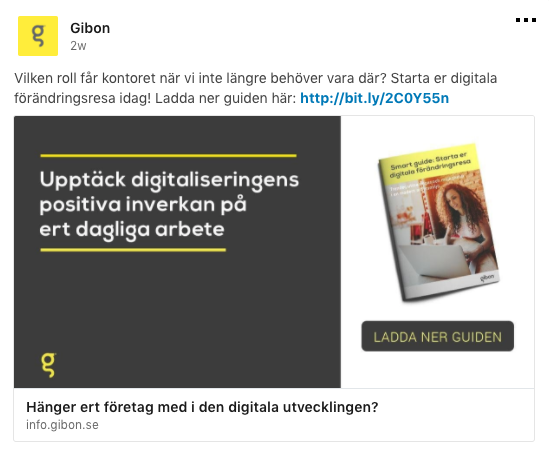 The landing pages are still active and continue to generate leads while Gibon is working on producing new and educational content for their prospects. Soon, they'll be ready to launch another campaign. With learnings and insights from previous campaigns, they'll be able to generate even better results and generate more leads. 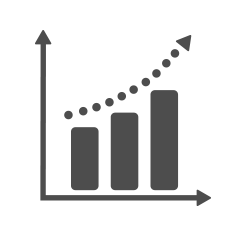 Do you want to generate more leads for your business and accelerate growth? Get in touch today for a commitment free conversation. Fill in your contacts below and we will contact you with detailed pricing information.